One of the aspects of family dentistry that we prioritize is patient comfort. The team at Ridgeview Family Dental in Warrensburg, Windsor, and Oak Grove work with gentle hands to examine, clean, restore, and enhance teeth of patients of all ages. Even with the measures that we take, we know that some patients may need a bit more. There is no benefit in letting dental anxiety stand between you and your healthy smile. Fortunately, we may have the secret to success: nitrous oxide. Anxiety is actually only one of a few reasons that patients ask us about sedation for their visits. Of course, fear is the top reason, and one that should not go unheard. If you feel frightened for any reason, whether the idea of local anesthetic or drilling of your teeth or the thought of your dentist lecturing you about taking care of your oral health, you will avoid the care that can keep you from painful problems. We prefer to set the stage for success from the onset of our work together. Who have a strong gag reflex. Gagging is not something we like to do. For some people, this natural reflex is so strong that teeth-brushing is a challenge. So, dental exams, cleanings, and restoration may feel an impossible fete. A benefit to nitrous oxide sedation that isn’t often discussed is how the gag reflex is relaxed under the effects of this gas. Don’t fully numb with local anesthetic. 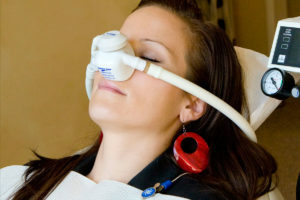 Nitrous oxide works in concert with the local anesthetic used to numb the mouth during dental treatments. If you have a difficult time responding to the Lidocaine solution, consider adding sedation to your next visit. Want to complete more work in less visits. Even when there is no fear of dental care, some patients choose to undergo several treatments in a single visit while under sedation. This is because, when nitrous oxide is inhaled, it relaxes the body, as well as the mind. This makes it more comfortable to sit in the dental chair for an extended period. We’re here to make your dental experiences as positive as possible. Call 660-747-9117 to schedule a visit with us.